For centuries the men and creatures of Krath have prepared for a conflict that many hoped would never happen. A half-blood, Adam Serre Shadow, now has just two moons to find the thief of the teardrop stone, stolen from his fire-breathing father, before the Council of Elders trigger all-out war. 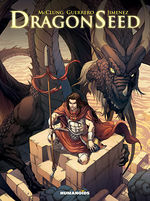 The son of a Dragon will stop at nothing to find the magical relic and preserve the fragile peace that still exists between the two species. This is a very elaborate story but besides this, the narrative grows on you and your desire to discovers the wonder it holds becomes ever more intense. This makes the series very promising. 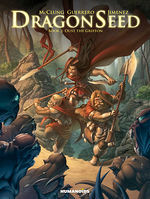 The story can be read over and over to greater appreciate its complexity and the flow of information, complemented by artwork of the highest quality. The action scenes are breathtaking (…) and the strange half-man, half-dragon hybrid idea is so original that it’s immediately captivating. 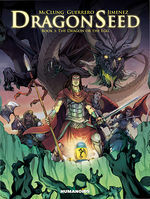 The story has a fast pace and the illustrations are great, especially the scenes with dragons.